Laser marking electronics is common for metal etching or engraving plastic packages that house microelectronic circuits. Laser marking speed, permanency, legibility, and the non contaminating nature of laser engraving are all qualities that the electronics industry demand. Companies that manufacture electronic components commonly use laser marking for final product identification as well as identifying electronic components during work-in-progress. In fact, the first widespread production use of laser engraving and laser marking was to serialize silicon wafers on integrated circuit production lines. Laser Impressions has the capability, qualified laser equipment, advanced technology and quality system to handle the most strict laser marking requirements. Laser Impressions advanced systems and procedures allow us to laser scribe silicon wafers and laser mark JEDEC tray handlers for I.C. packages. Laser Impressions laser marks all SEMI standard fonts, including 2D matrix codes with unsurpassed repeatability. Find out how Laser Impressions can streamline your production workflow and help with part identification. 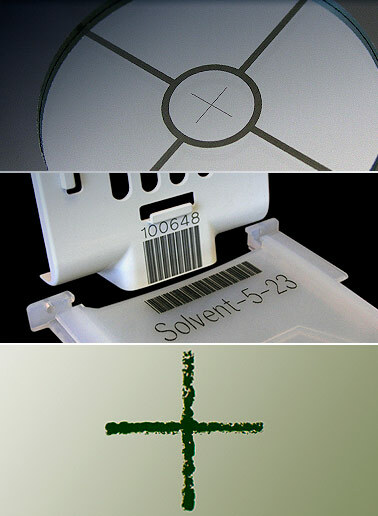 Call one of our silicon wafer and semiconductor laser marking specialists at +1(800) 344-5273.